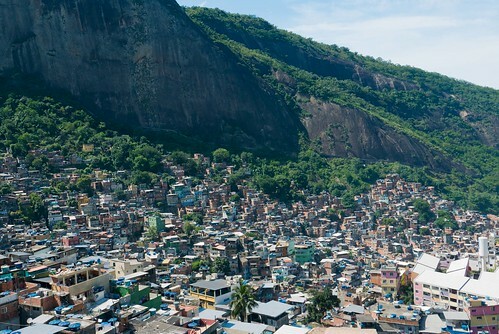 The English translation of favela is “slum”; 20% of the Brazilian populace live in them and there around 1,000 in the country. 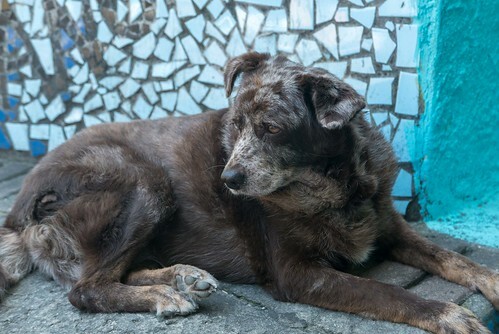 They are often portrayed in the media as drug-riddled no-go zones controlled by gangs, where tourists are robbed (or worse) if they step foot in them. 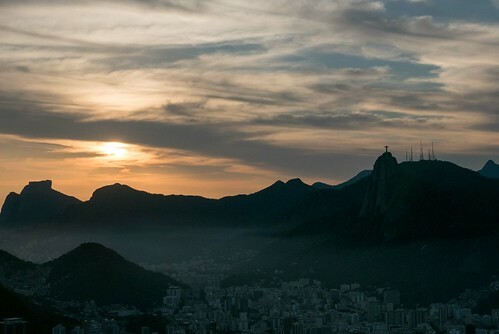 The reality is a lot more complex as we found out when we joined a favela tour the next morning. 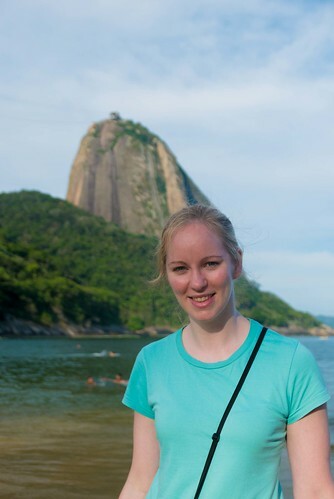 Aiming to dispel some of the myths surrounding Brazil’s poorest areas, our guide Marina took us to Rocinha, Brazil’s largest favela with a population of over 80,000 people. 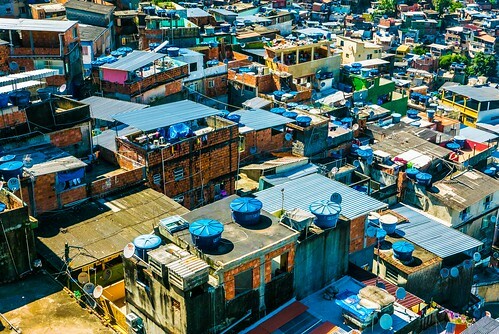 Favelas grow organically – from shacks made of bits of wood and sheet metal up to fully constructed buildings; because the law states that if you occupy public land for 5 year it’s yours, and because the government want little to do with the favelas, they’ve grown largely unchecked. 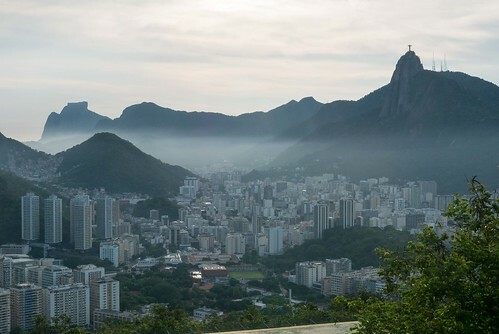 It also helps that a lot of the residents of favelas have come from the construction industry so are well-versed in throwing up buildings with a modicum of structural integrity. Apartments appear overnight next to each other – it’s a regular occurrence to be able to look out of a window over the bay one day, and the next to be faced with a brick wall where a new neighbour has taken it upon themselves to erect a new property. Only in the last decade or so have the police begun to take the drug crime seriously and actually do something about it. 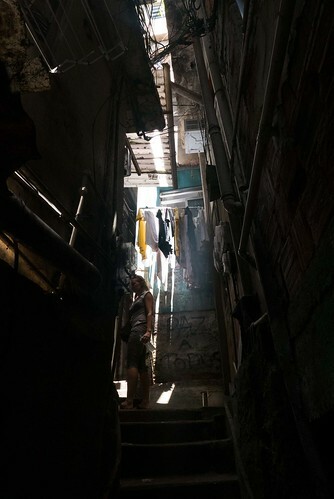 A process of “pacification” has taken place in 39 favelas so far where, after a lengthy observational period (often a year or more) tracking the movements of the drug gangs and understanding the layout of the favelas - which have no street names in most cases - a co-ordinated effort of thousands of police descend on the favelas and wrest control back. 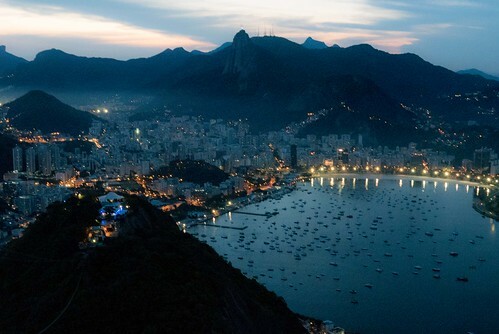 Most of the populace don’t want drugs in their neighbourhoods anyway, so pacified favelas are much happier places. As Marina told us, there’s a difference between poverty and misery, and whilst life is often tough, many of the residents won’t go elsewhere. 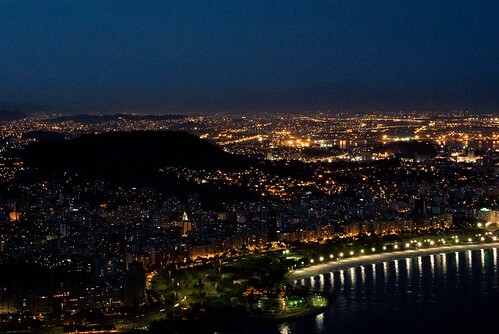 They are self-governed communities, most with family and friends who have lived there for some time, they police themselves, and they are incredibly entrepreneurial. 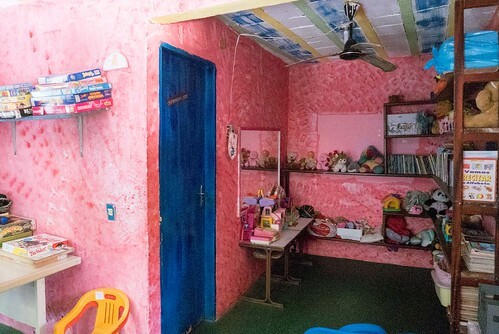 Favelas don’t pay taxes, and we visited one building where the owner had built floor upon floor of apartments and was renting them out at 700 reais (~£130) per apartment, and bringing in around 30,000 reais (~£5,500!) of income per month. 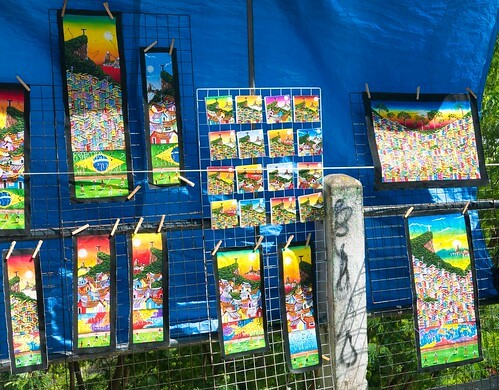 Indeed, a kind of middle class has emerged within the favelas. 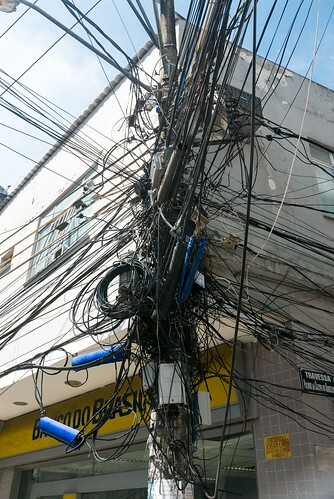 Most of them have water (the blue tanks you can see on the top of each building) and electricity, although the electrics are essentially an incomprehensible mass of wires so tangled that only the bravest repair person would dare go near them. The minimum wage is the equivalent of about £150 per month, which is one factor in why drug crime managed to become so rife – children under the age of 18 cannot be sent to jail, and once they reach 18 their records are wiped clean. They can live a life with impunity, making them the perfect vehicle for transporting drugs around. The government is being lobbied to change the law, but it’s a slow process. 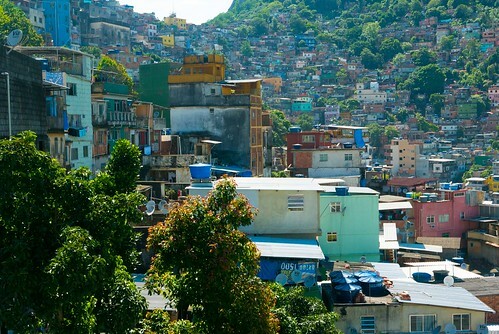 Rocinha was pacified in November 2011 and it’s safe to walk around. 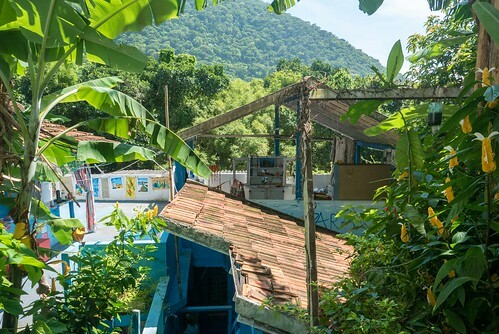 Safe, but not easy – there’s one main road winding its way through the favela because it was built on the side of an old Formula 1 track. 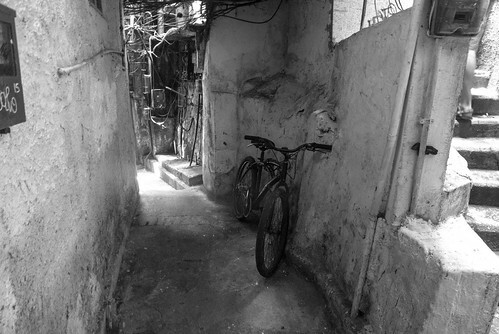 Other than that, the only way around is through a labyrinth of alleys separating the thousands of buildings. I don’t have the best sense of direction (or any, in fact) as anyone who has watched me trying to drive somewhere without a sat nav can attest. Or even with one. 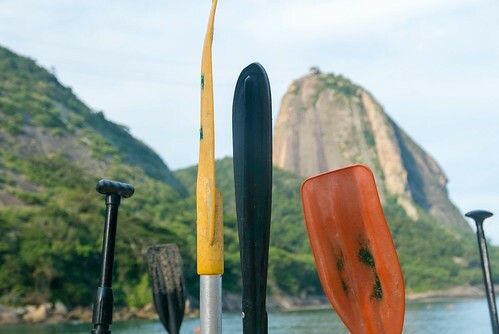 So without a guide, it would be insanely easy to get lost. 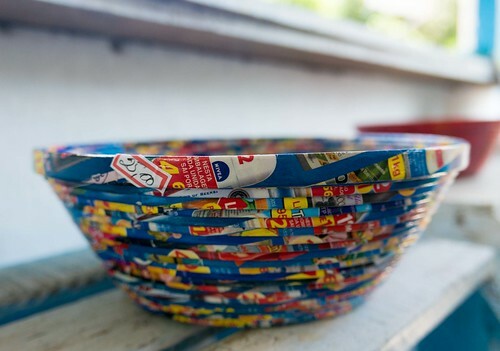 The residents are incredibly resourceful and artists have used things like discarded magazines and even old records to fashion colourful artwork to sell. Little goes to waste here. 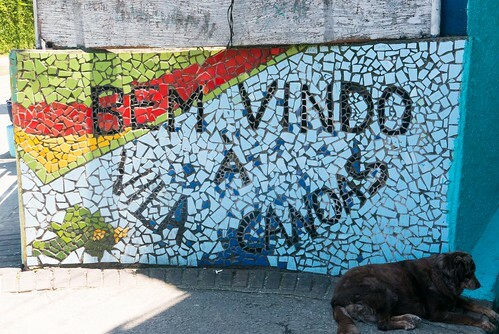 The second favela we visited was Vila Canoas, a much smaller dwelling with around 3,000 residents. 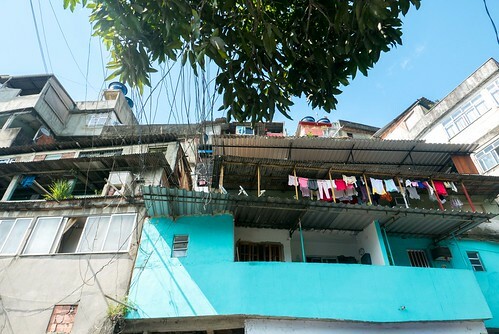 Many favelas border rich neighbourhoods, and this is no exception – the start of the favela on one side faced a row of Brazilian mansions on the other. 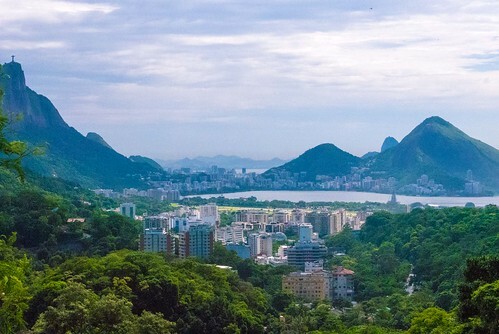 Favela residents often work for the wealthier populace, so proximity to their workplace is important. 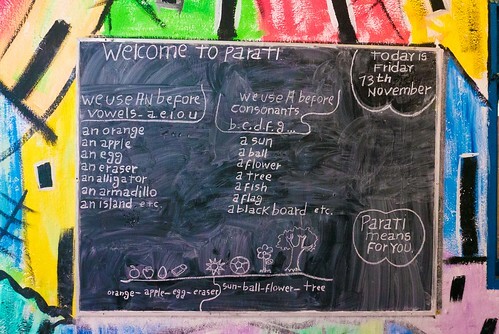 Marina took us to a school set up by the owner of the Fiat car company, who wanted to give something back to the community. 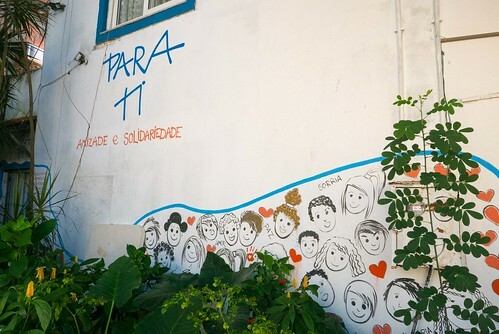 Para Ti has classes for favela children (private schools for the rich kids – such as a nearby American school which charges $6,000 entry and a further $2,000 per month – are clearly beyond the price range of the locals), and they are available every day. There’s a playroom and even yoga classes; a lot of kids have rough upbringings which then spills over into aggression at school, so yoga helps dissipate this. It’s a great idea – I wonder if it’d ever catch on in the UK. 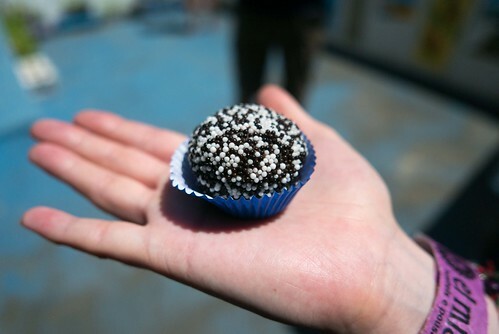 Whilst we were looking around the school, we got the chance to try a homemade brigadeiro (chocolate truffle) and it was divine. 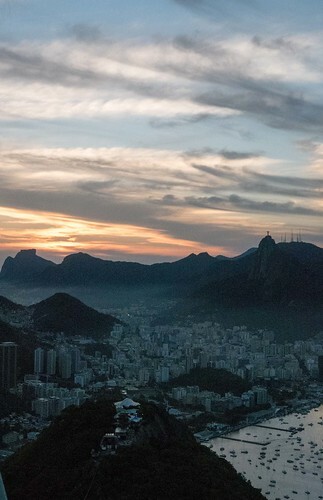 I left the favelas feeling a little more optimistic. A lack of money doesn’t mean a lack of pride, and it’s clear that the people here are hard-working and resourceful. Their portrayal by the media has resulted in a stigma which is undeserved in most cases. 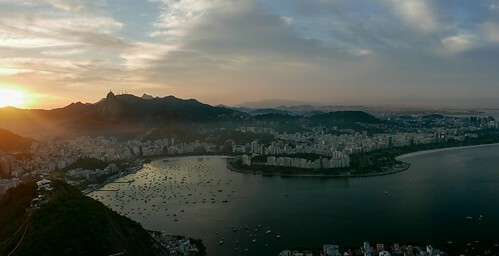 The favelas aren’t going anywhere – there are too many people for that – but with the government now agreeing to hand out deeds for the land which the residents have built on, they may finally start getting acknowledged as a part of normal society, and in time, perhaps even absorbed into the wider Brazilian populace….assuming they decide they want to be. 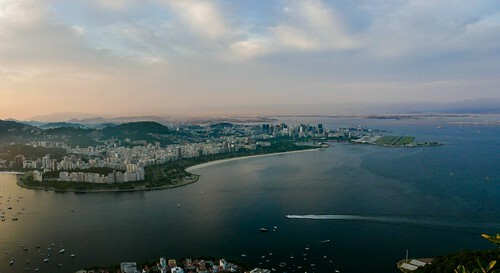 Sugar Loaf is comprised of two viewpoints reached by two separate cable cars – the lower one offers a good view on most days, but the higher one is completely dependent on the weather. 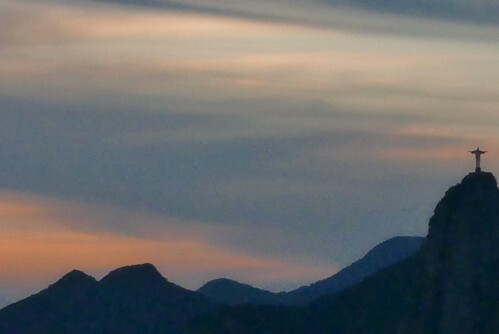 Amit had been a couple of days earlier and said he could barely see a thing from the top due to cloud cover. 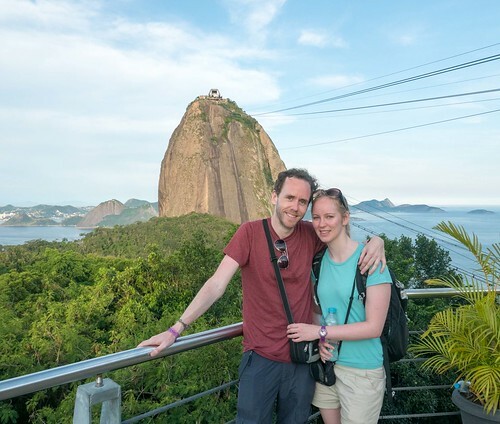 We managed to get lucky – not only with the weather, but also the timing; we arrived about an hour or so before sunset, which meant that we got to appreciate the view of Cristo Redentor bathed in wondrous colours as the light faded, before appreciating Rio lighting up at night. I could have filled an entire blog of photos from our trip up there but decided to pick a few (OK, maybe more than a few) of my favourites to highlight the beauty of the place. 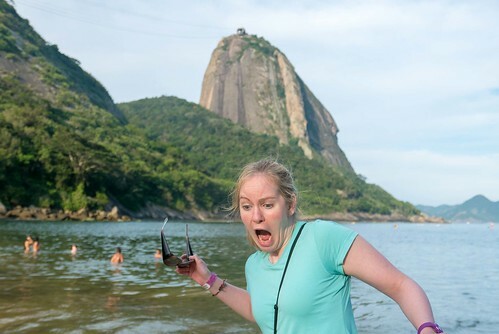 We somehow managed to find a bus back to Copacabana after almost giving up searching for the bus stop. Our run of luck continued when we got back and I decided to take the advice of a website I’d found and held down the laptop’s power button for 30 seconds. I was rewarded with the power coming back on – all was well again! Well, once Windows had sorted out the updates which had knocked it out in the first place. Thanks, Microsoft. 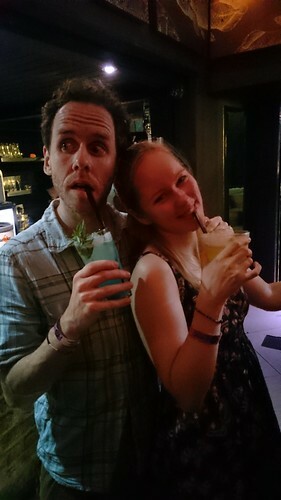 The night was still young, and it was a Saturday, so we decided to make the most of Rio’s nightlife and headed to Lapa. This is the party area from Thursday to Saturday, and the bars are swarming with locals and tourists alike. 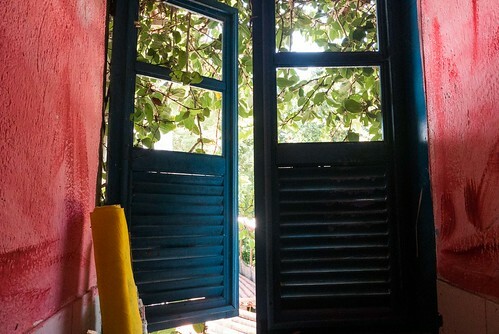 Getting off the metro station at Cinelandia and walking the half-kilometre there can feel a little intimidating, as there are no shops open and a lot of shady locals wandering around so going on your own may feel a little risky, but we didn't have any issues. We immediately set about finding food and beer, both of which were offered in abundance by the identikit stalls that are set up by the arches. 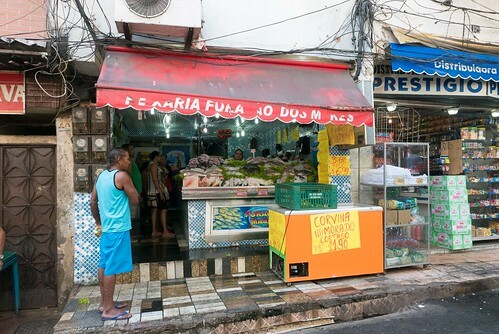 If you ever wanted to find a burger, caipirinha or chicken on a stick, then this is the place to come – there are at least fifty stalls. Gilly went for the chicken, I went for a burger, and Amit went for a stick and a hot dog. 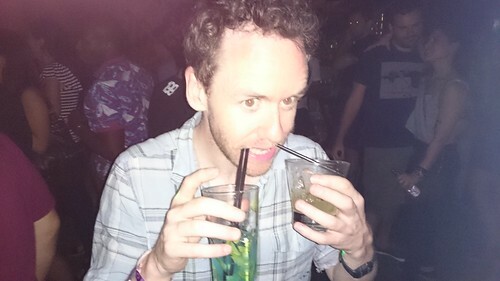 In hindsight, it would have been a good idea to do the same to soak up the forthcoming alcohol, but you live and learn. 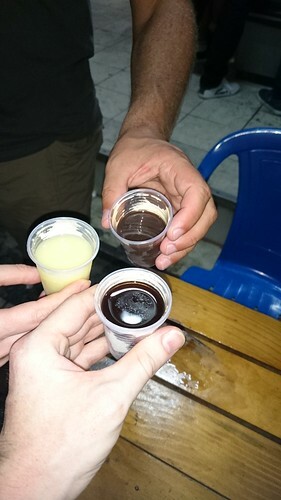 After a couple of Antarctica beers each, we took the advice of a hostel rep and sought out Bar da Cachaça where we had a shot of the eponymous spirit each - passion fruit for Gilly, açai for me, and chocolate with pepper for Amit. 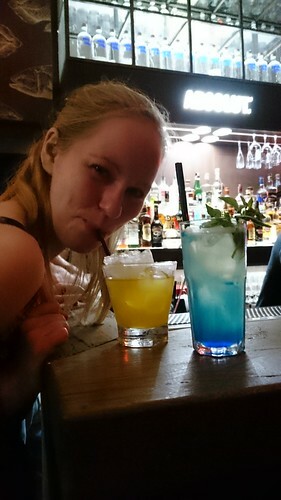 They were all pretty strong, and all delicious. 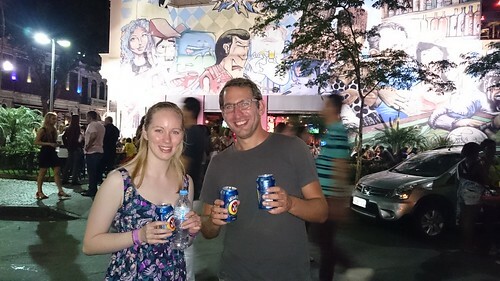 A couple of craft beers (or what passes for craft beer in Brazil - it ain't Brewdog!) 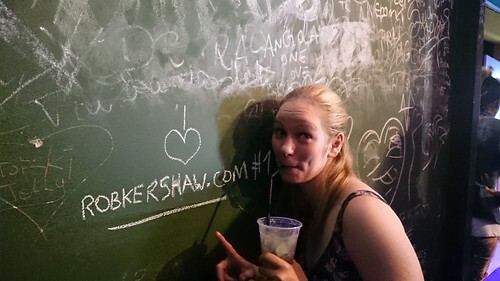 in another bar were followed by caipirinhas and shameless self promotion in Boteco da Garrafa, which in turn were followed by some sort of cocktails whose names escape me, in a bar whose name escapes me, which in turn were followed by some crazy dancing in a club which I have little recollection of entering. Nor, in fact, that of the taxi we took home at some crazy time in the morning. 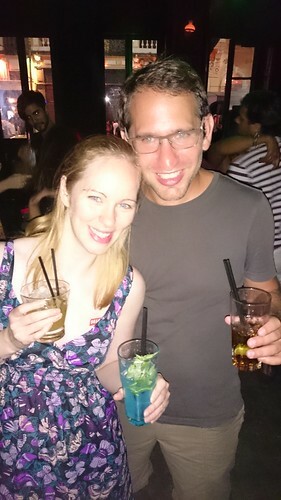 My phone photos recall the later stages of the evening better than I do, but suffice to say it was a fantastic night, and Lapa is definitely a must-do for anyone looking to experience some of Rio's crazy nightlife.